The United Nations Office for the Coordination of Humanitarian Affairs (UN OCHA) and Pacific Disaster Center (PDC) are joining efforts to enhance humanitarian assistance for natural disasters worldwide. While by no means a new partnership, PDC and OCHA are breaking new ground, codeveloping analytical products supporting OCHA’s Regional Office for Asia and the Pacific (ROAP). Discussions are also underway to produce similar products for its Regional Office for Latin America and the Caribbean (ROLAC). The new products are designed to quickly inform humanitarian assistance providers with critical information about the potential impact of disasters—highlighting needs for vulnerable populations during response operations. With data provided by both UNOCHA and PDC, this joint exercise product, depicting simulated flood impacts within the DPRK was showcased during a recent UNOCHA workshop. Mr. John Marinos, Regional Information Management Officer at ROAP, said he is pleased to be expanding upon on the 10-year partnership between the ROAP and PDC to produce rapid disaster impact analysis products. “By combining our expertise and data with PDC’s modeling capabilities, we can estimate, as soon as possible, who is affected by a disaster and where. By estimating the number of people likely to be in need of assistance, we can reduce the time between a disaster occurring and launching an informed response to support people in need,” said Marinos. As an extension of the broader partnership initiative, PDC Disaster Management Specialist Todd Bosse recently participated in the 2018 Global INFORM Partners Meeting at the UN headquarters in Geneva to continue collaboration on risk assessment at the national and subnational level. “As a technical partner of INFORM, PDC is committed to ensuring the latest advancements in risk assessment methodologies are leveraged for disaster planning and preparedness worldwide,” said Bosse. He continued, stating that PDC and INFORM are exploring new channels to communicate risk data so it can be more actively applied in disaster management decision making. PDC demonstrates how UNOCHA’s HDX data was used to produce potential impact analysis for officials responding to Columbia’s Hidroituango Dam emergency. 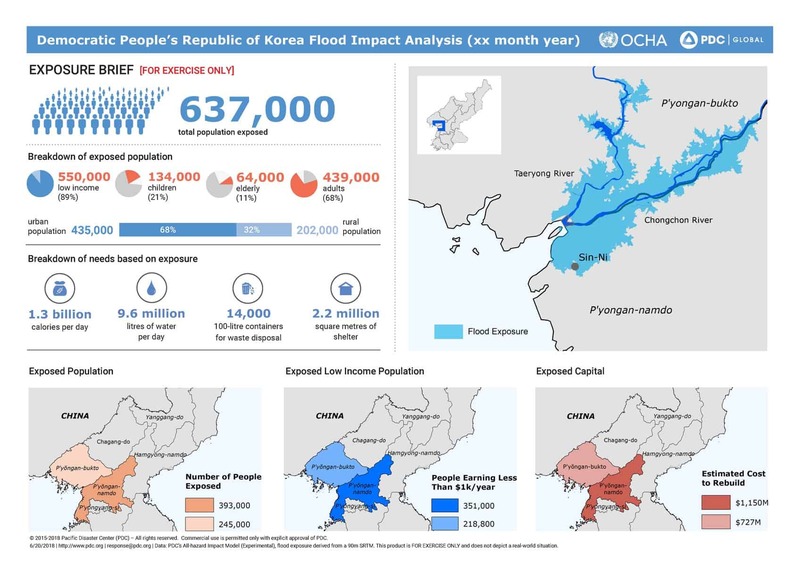 With data provided by both UNOCHA and PDC, this joint exercise product, depicting simulated flood impacts within the DPRK, was showcased during a recent UNOCHA workshop. At center, John Marinos, Regional Information Management Officer with UNOCHA ROAP, visits PDC Headquarters to collaborate on joint situational analysis products. Left to right: PDC Disaster Management Specialist Todd Bosse; Regional Information Management Officer with UNOCHA ROAP John Marinos; PDC Director of Disaster Services Dr. Erin Hughey; PDC Disaster Services Analyst Cassie Stelow .